As global warming increasingly affects global ecosystems, low-level regional conflicts become more susceptible to escalation. Scientists have seen the Sahara in North Africa expand in recent years at alarming rates as desertification and overgrazing has exacerbated water and wind erosion as well as increased soil salinity. This accelerated degradation forces nomadic tribes, such as the Berbers, to become more sedentary and urban, further magnifying the pressure on local resources. 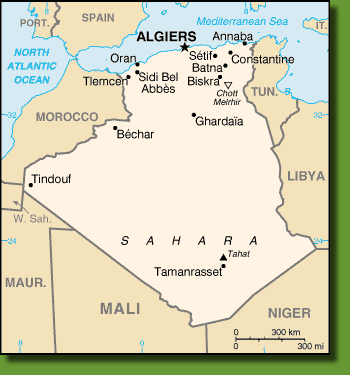 Taking into consideration the well-established history of Arab-Berber violent conflict in the region, continued desertification of the Sahara will undoubtedly lead to further and more widespread violence as people come into competition over decreasing arable land and resources. This case study proposes to examine these variables with the aim of analyzing the potential for increase conflict among Arab and Berber populations in the Sahara region. According to H. E. Dregne of The Center for International Earth Science Information Network, “about 18 of the arid regions of Africa are severely desertified,” a significant portion of that is the mountain slopes and plains of North Africa . As water becomes scarcer the land is unable to support as many people, thus leading to greater poverty and environmental pressure. As farmers struggle to keep up with increasing food demand, they are forced to use more destructive irrigation practices in order to meet the demand . Growing populations are another problem as well, adding more demand for food, leading to overgrazing and ultimately accelerating the desertification process . Drying water tables in the mountains and plains of North Africa are increasing the salinity and reducing productivity of soils and animals . Moreover, the shortage of arable land is forcing formerly nomadic people to settle into urban environments, further increasing the pressure on the water and food resources. The Berbers, or more correctly – the Amazigh, have resided in North Africa for thousands of years. They are considered to be the descendents of the original indigenous inhabitants of North Africa. There are records of tracing them back to the time of the ancient Egyptian empires, at least to the fifth century B.C.. Berbers have survived Christian and Muslim conquest of the region, maintaining large communities throughout Morocco, Algeria, Tunisia, Libya, and Egypt as well as in the regions west and south of the Sahara. Though predominantly Muslim by virtue of Arab conquest, they have held tightly to their Amazigh heritage. There are a number of Amazigh movements afoot that strive for greater autonomy and recognition among their Arab neighbors, at times leading to violence, most notably in conflicts in Algeria and Morocco. The increased rate of desertification in North Africa has serious implications for the peoples of the region. Pressures on water and food resources are resulting in increased scarcity and urbanization, leading to greater competition among ethnic groups. With the path of confrontation already well-laid between Arabs and the Amazigh, the potential for increased conflict is significant. As stated, there is a history of violence and oppression between the Arabs and Amazigh that stretches back for centuries. Algeria has been a recurring focal point for conflict between the two groups, in particular within the recent past . With environmental issues as a new impetus for conflict, we could see protracted and violent conflicts between Arabs and Amazigh over the next few decades. Desertification is the process by which plant life is rapidly depleted and topsoil is lost at desert boundaries and in semiarid regions. This is usually caused by a combination of drought and the overexploitation of vegetation by people. Desertification has been occurring at an increased rate for thousands of years, particularly in North Africa. Research conducted recently by German scientists points to “feedbacks in the climate and vegetation systems” as a major cause of Saharan desertification. The Young People’s Trust for the Environment reports that only 12 of the fifty-one African countries are able to supply enough food to feed their people. This points to a serious problem in the at-risk areas surround the Sahara that could lead to conflicts among people vying for food and land resources. As of 1986, it was reported that Algeria had been subjected to “especially serious water erosion” leading to loss of productivity of animals and soil fertility. This has undoubtedly gotten worse over the past twenty years. An increasingly sedentary population, combined with overgrazing and poor crop management and irresponsible well drilling, has led to an increased rate of desertification. As water usage increases, the water table begins to drop and makes the soil salty. This salination process makes the land less arable and creates competition for productive soils for farming and grazing. The subsequent scarcity of useable water and land can potentially lead to conflict. Berbers living in remote and mountainous areas are the first to be hit as the larger Arab cities pull in more and more water. The Center for International Earth Science Information Network (CIESIN) reports that, "About 18 percent of the arid region of Africa is severely desertified, and most of that represented by grazing lands and rain-fed cropping lands on the south side of the Sahara. 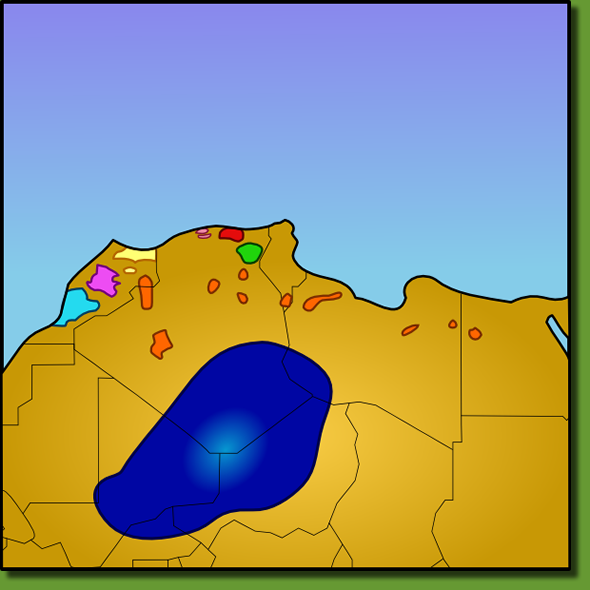 The other large area that is severely affected is the mountain slopes and the plains of North Africa. Moderate to high salinity affects about 30 percent of the irrigated land in Egypt" . Popular discontent has risen over the past 10 years. Riots and demonstrations broke out in the Berber town of Kabylia after a youth was killed while detained by the police in April of 2001. The demonstrations were brutally quelled resulting in the shooting deaths of scores of protesting youths. More than 60 people were killed and 2,000 injured in Berber areas in December later that year in renewed riots and protests. All in total, over 120 people were said to have died that year. Though things have settled down considerably, the potential for future flare-ups is strong. This causal loop diagram shows how climate change will affect the conflict. As desertification increasingly spreads northward towards the Mediterranean, the land will be stressed in its ability to continue producing under the affects of increased salination and erosion. Both the Arab-majority and the Berber minorities will struggle to meet their food demands. This will exacerbate ethnic tensions possibly leading to more generalized civil strife and even war. While the conflict's immediate sphere will be civil and regional, spanning across the Maghreb, there is little doubt that international entities such as the UN, NATO, the African Union as well as France and the US would get involved if comprehensive hostilities break out and a refugee crisis is created. While there have been minor ethnics conflicts between Arab and Berber-minority populations within recent past, the fullness of the conflict will be realized as climate change continues to affect the region over the next few decades. Looking at more detailed results based upon the full search criteria, some facts jump out at us. All of the related cases occur in the last thirty to forty years. While there is one case in Asia ( India), the rest of the cases predominantly take place in northern or sub-Saharan Africa. The cause is split nearly 50/50 with half as a result of damage to the habitat or environment while the other have are a result of conflict over access to resources. The majority of the cases take place in dry climates. The case studies are almost evenly split between high- and low-level conflicts. Similarly, they are both divided as direct or indirect causes of environmental damage. The conflicts occur mostly intrastate or between sub-state actors while a couple have spilled over into regional conflicts. Finally, while only one has been resolved by decisive victory, two have ended in compromise, two in stalemate, and two are still on-going. Ethnic tensions are a consistent theme among all the cases returned. Whether they break out in high or low-level conflicts, the worse ones are almost exclusively tied to ethnicity and genocide ( Rwanda and Sudan). As it relates to my paper proposal, these results have some serious implications. Focusing on the relations between Algeria and its Berber minority, as desertification continues to destroy the borderlands, the already contentious relationship between these two people groups will invariably flare up as they compete for disappearing water and land resources. Science Daily. "Sahara's Abrupt Desertification Started By Changes In Earth's Orbit, Accelerated By Atmospheric And Vegetation Feedbacks". American Geophysical Union; July 12, 1999. Dregne, H. E. 1986. Desertification of arid lands. In Physics of desertification, ed. F. El-Baz and M. H. A. Hassan. Dordrecht, The Netherlands: Martinus, Nijhoff.